Are you looking for the electric heating and cooling device that will help you save money on the utility bills and increase the comfort no matter is it winter or summer time? Look no further, Frigidaire heat pumps are what you need. Frigidaire is a popular name, offers models for the budget-oriented homeowners and those who want more power, efficiency, lower environmental impact, quality elements and top-notch features. Heat pumps, such as those from Frigidaire are powered by electricity and can work with the gas furnace. They operate as the AC, cooling during summer and opposite in winter, but faster and more efficiently, plus dehumidifying for an enhanced climate. Frigidaire heat pumps are the great option and the perfect devices to make your house temperature more pleasant. Want to know more about them? Take a further look into this article and find out more about these heat pumps from Frigidaire with our review & buying guide! A heat pump can offer the same benefits you have with an AC system, yet it provides all of that but much more efficient, plus heating during the cold weather and dehumidifying. It works perfectly with the air handler and the gas furnace. And what’s even better, heat pumps are also more reliable and often last much longer than an AC system while being friendly to the environment and energy efficient. According to the manufacturer, you can save 30-60% energy during the winter, just on heating. There’s no device as versatile as a heat pump as it is heating, cooling and dehumidifying the house. You need to change the mode, and the device will be able to cool you down in the hottest months and warm you up during winter while keeping the indoor climate at the most comfortable level. By using the heat pump technology instead of heating by gas or oil, electric heat pumps are much more efficient at energy use, because instead of generating heat, they move the heat from the surrounding warmer air to the refrigerant. What’s more, they use up to 50%-200% less electricity than ACs. Heat pumps tend to have a higher price when you initially buy them, yet they are much more cost-effective in the long run. The process of heating & cooling of a heat pump makes them much more efficient when using electricity, so they eventually use less energy and reduce electricity costs. No heat pump produces CO2 or any other pollutant that could harm the environment, as they are electric. Primarily because they use only electricity, the working process of a heat pump leaves no greenhouse gases at all. Heat pumps improve the air quality of your home thanks to the efficient & environmentally friendly process of heating, cooling and dehumidifying. With less condensation, less use of electricity & fuel, and enhanced air filtration, the air that comes out of heat pumps is free of dust, odors, spores, or any contaminant. So, do you feel like a heat pump is an excellent option for you? Then take a look at the many Frigidaire heat pumps options you have here! Frigidaire heat pumps are found in five sizes, which are coming from the budget-friendly E series and advanced and pricier F series. Due to the high efficient operation, all the models are Energy Star approved, some provide more, some less in savings. The iQ Drive system found in Frigidaire FSH1BG offers one of the best performances in the market and efficiency of up to 19 SEER and 10 HSPF. No matter of the weather outside, your comfort is guaranteed as the modulating work from iQ Drive system provides consistent temperature and less humidity, as it is adjusting the power according to the demand. Found in 2-5 ton capacities, these are the most advanced models from Frigidaire, also the most expensive. Top-Notch Performance:The inverter-driven rotary compressor uses between 49% and 118% of capacity to reduce costs, promote better heating & cooling ability, and at the same time avoid damage to the environment while being the quietest thanks to the innovative comfort ecoLogic technology. The ecoLogic technology stamp found on the unit indicates that the model is equipped with the two-stage, variable-speed indoor and outdoor fan motors. Excellent Efficiency:The FSH1BG surpasses ENERGY STAR efficiency standards delivering top-notch performances at the same time. Long-Lasting & Reliable Quality: Made to last longer, reduce energy costs, and at the same time produce much more satisfying heating & cooling at home. The operation is pretty quiet as the noise level is in the range from 58 to 73 dBA, thanks to the sound blanket that reduces the noise from the compressor and discharge muffler, also reducing the noise and vibration from the compressor. *It can be found in models from 24K up to 60K BTU according to your needs. Other high-efficient models from Frigidaire, but cheaper than the above models are coming from the FSH1BF series. These models are great choice for the users who want to save energy and at the same time reduce utility bills, without paying the premium price. While they come with the same 2-5-ton capacity, the efficiency rating is little lower - up to 16 SEER and 9.0 HSPF. Performance: With the two-stage heating & cooling processes of the FSH1BF, you will obtain superior performance while increasing dehumidification and decreasing problems with temperature inconsistencies. The model uses the two-stage Ultra-tech Copeland Scroll compressor. During the milder summer weather, the compressor will mostly work in the first stage using about 68% of its cooling capacity, while trying to meet the demand and save on energy. The fan with the variable-speed will prevent sudden temperature swings as the motor increases its power slowly. Much More Reliable & Efficient: With the CoreSense technology, the device is capable of detecting several problems such as compressor damage & refrigerant problems. When a problem is detected, the device automatically shuts down to reduce energy waste. Quietness & Effectiveness: Using the ecoLogic technology, the FSH1BF is capable of delivering much better performance while reducing costs & energy use. And what’s even better, it does it in the quietest of ways thanks to its sound-blanking construction. The sound level, depending on the model is between 75 and 78 dBA. The performance & efficiency will help you achieve a much more comfortable experience at home, whether you use it for heating or cooling. With an 8.5 HSPF efficient and 15 SEER performance, you can reduce bills, save energy, and at the same time receive excellent results according to your needs at a mid-range capacity. This is the simplest model in F-series where the models are equipped with the single-stage motor, which operates only at the 100% of its cooling capacity. Used in residential homes, FSH1BE are available from 1.5-5-ton capacity. Quiet & Reliable Performance: With the Micro-Channel coil anti-corrosion construction and the swept-wing fan blade, you will receive a calm operation while also achieving much more reliable performance in the long run. The motor is heavy-duty which ensures long operation even during the harsh weather. Quality Finish & Operation: The 15 SEER heat pump with a variable-speed motor alongside the steel finish of the FSH1BE promote higher quality regarding operation & durability and reduced sound when compared to conventional. Excellent Potential Efficiency: Tested more than 144 times, every FSH1BE model provides an Energy Star standard that promotes better use of energy and much better reliability in the long run. The sound level is from 72 to 75 dBA. *It comes in models from 18K, 24K, 30K, 36K, 42K, 48K and 60K BTUs. Environmental protection & exceptional performance at max, the ESH1BE with 9.0 HSPF is the high-quality heat pump for any user who expects a high-range performance for a mid-range cost. What’s more, the device comes with a variety of features for everyone. Exceptional 2-Stage Performance: The Copeland Scroll compressor with UltraTech technology promotes an outstanding 2-stage performance for superior heating & cooling capacity while improving overall efficiency and comfort when using. Durable Steel Construction: The galvanized steel and urethane construction of the cabinet make the ESH1BE a fantastic choice for anyone who wants reliability & good looks with their device. Quiet & Reliable: With the demand defrost mode that works only when needed and the hot gas muffler, you will receive not just one of the most reliable performance but also one of the quietest. If you want to get a fantastic performance with the perfect quality out there, the ESH1BE is capable of doing just that. What makes this model so magnificent is its efficiency, using a split cooling system and top-notch coils from Frigidaire. 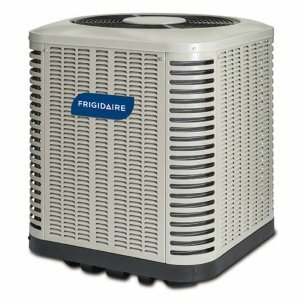 This is the simplest and cheapest group of Frigidaire heat pumps. They operate from 1.5-5-ton capacity. With a permanently lubricated motor and the best construction in the market, this ESH1BE model is capable of going the extra mile with less maintenance and 100% performance for longer. Efficiency & Protection: The ESH1BE is one of the most efficient in the market, and not only because it comes with a superior compressor but because its valves & overall construction surpass every other model despite its low-range capacity. Quietness to the Max: Something that makes the ESH1BE stand out from the rest of heat pumps is its ability to work at 100% but still deliver very quiet operation. And all of this thanks to its high-quality swept-wing fan blade. Frigidaire efficiency & comfort quality delivered in each device is unmatched by any other company in the market. With top-notch performance and the most reliable designs, using Frigidaire heat pumps assures you an entirely satisfying experience and excellent results with your home appliances. You will receive, also, an outstanding service whenever you need it, and top-notch attention. What’s even better, all of these heat pumps from Frigidaire are made with efficiency in mind, not only providing the remarkable performance you want but a much more environmentally-friendly result. Want the Best Frigidaire Heat Pumps? If you want the best heat pump model, go for the FSH1BG Heat Pump with 19 SEER, and 10 HSPF alongside the exceptional iQ Drive motor design. This way you will receive the best efficiency and the best performance regarding capacity & reliability.